More Information – This web page has only summarized some of the information about Golden State Squares. Check out the other web pages on this web site to get a better understanding of what we are all about, including contacts and answers to frequently asked questions. We have also provided links to other clubs which should help you get a reasonable picture of the extended gay square dance community. Finally, we highly recommend you attend one of our free open houses in September to learn more about us. See “Classes” for more information. Who We Are – We are a gay and lesbian square dance club from Orange County, California. Our club was formed in 1986 and continues to thrive today. Our membership is comprised of men and women of all ages and walks of life. Check out our photo gallery to see us at some of our events. Although we are primarily oriented towards the gay and lesbian community, all square dancers are welcome to dance with us. 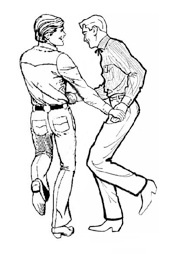 There is no dress code in gay square dancing--we like things casual and comfortable. What is Gay Square Dancing? – Modern gay square dancing is different from the traditional square dancing you may be familiar with. Although the calls we use are internationally recognized, gay styling is often applied which makes dancing even more fun. A square is comprised of four couples facing each other in a square formation. A caller issues commands--usually mixed with music--which the dancers then follow. There are a wide variety of calls of different complexity. By mixing them together, a caller choreographs the dancers in fun and challenging ways. Square dancing is not physically difficult, but it does involve learning a series of calls within an appropriate dance level. It cannot be learned as quickly as line dancing or two stepping. However, once you learn it, you have numerous dance opportunities available to you each month all over the country, and even internationally. Where & When We Dance? – Golden State Squares holds monthly dances and weekly classes at the First Congregational Church in Santa Ana. Located just off the 5-freeway near the Main Place shopping mall, the facility is spacious and has ample parking. Click on directions for a detailed map to our hall. We generally have a club dance the first Saturday of selected months, from 7:00 PM to 10:00 PM. See dance schedule for more information about our upcoming dances and other events. Why We Do It? – Because it's fun! In addition to being able to dance at our club events, square dancers can dance at other clubs in the area and across the country. There are also special events each year like the International Convention, which is hosted by a different club or group of clubs each year. Next year it will be held in St.Louis. Typical attendance at the convention is around 1000 dancers! How To Join Us – If you don't presently know how to square dance, we invite you to attend our classes to learn how. You can attend classes at other area clubs as well. If you know how to square dance, you don't need to be a club member to attend our events. Simply show up. If you would like to officially join our club, all you need to do is get an existing club member to sponsor you, which should not be a problem if you know how to dance. Ask any club officer for details.